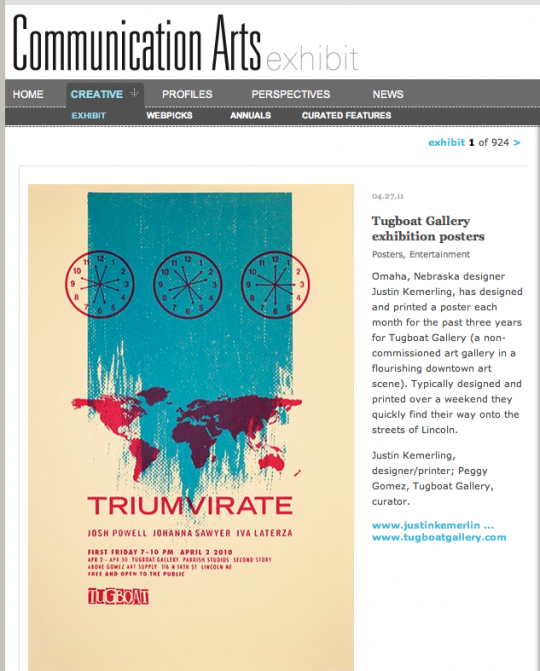 [caption id="attachment_4595" align="alignnone" width="540" caption="Tugboat Gallery exhibition posters CA Exhibit"] [/caption] Communication Arts added four of the Tugboat Gallery posters to their very impressive collection of Exhibit work. It's great to get these posted by a creative organization I've always highly respected for their vision and inspiration. This entry was posted on Thursday, April 28th, 2011 at 5:40 am by Justin Kemerling	and is filed under Design, Work. You can follow any responses to this entry through the RSS 2.0 feed. You can leave a response, or trackback from your own site.